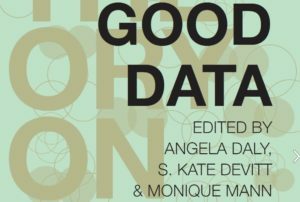 Lonneke van der Velden, Guillén Torres, Becky Kazansky, Kersti Wissenbach, and Stefania Milan have together co-authored a new chapter appearing in the newly published Good Data book, edited by Angela Daly, S. Kate Devitt and Monique Mann. ‘Big data’ is a hyped buzzword – or rather, it has been for a while, before being supplanted by ‘newer’ acclaimed concepts such as artificial intelligence. The popularity of the term says something about the widespread fascination with the seemingly infinite possibilities of automatized data collection and analysis. This enchantment affects not only the corporate sector, where many technology companies have centered their business model on data mining, and governments, whose intelligence agencies have adopted sophisticated machin- ery to monitor citizens. Many civic society organizations, too, are increasingly trying to take advantage of the opportunities brought about by datafication, using data to improve society. From crowdsourced maps about gender-based violence (‘feminicide’) in Latin America, to the analysis of audio-visual footage to map drone attacks in conflict zones, individuals and groups regularly produce, collect, process and repurpose data to fuel research for the social good. Problematizing the mainstream connotations of big data, these examples of ‘data activ- ism’ take a critical stance towards massive data collection and represent the new frontier of citizens’ engagement with information and technological innovation. In this chapter we survey diverse experiences and methodologies of what we call ‘data-activist research’ – an approach to research that combines embeddedness in the social world with the research methods typical of academia and the innovative repertoires of data activists. We argue that such approach to knowledge production fosters community building and knowledge sharing, while providing a way to fruitfully interrogate datafication and democratic participation. By exploring what we can learn from data-activist projects and investigating the conditions for collaboration between activist communities and academia, we aim at laying the groundwork for a data-activist research agenda whose dynamics are socially responsible and empowering for all the parties involved.